UNTIL HIS DAD FINALLY SAID HE COULD DRIVE THERE. At age three years, nine months, and five days, Mitchell is too young even for drivers' ed, but when his own personal license is presented to him by his game dad, he settles himself like a pro in the driver's seat (Dad's shoulders), grips the wheel (Dad's ears) firmly, and takes his new vehicle out for a trial spin. Hmmmm! That windshield (Dad's glasses) could use a better set of wipers. Then, VROOM!, Mitchell is off in his own little deuce coupe for a trial run. Mitch has a small fender-bender with the wall on the first loop, but with a quick shift into reverse, he's back on track. Honk! Honk! He hits the horn (Dad's nose). Now Mitch is getting comfortable with his brakes and transmission system, but poor Dad is beginning to pant a bit from the pace. A spot of "oil" from Mitchell's sippy cup poured under the hood (long-suffering Dad's mouth) fixes that sputter, but Mom the Mechanic make another observation. "YOU NEED GAS," SHE SAID. Mitch flips on his headlights (flashlight) and motors by the drive-in (kitchen) and right up to the cookie jar. "NO GAS," SAID THE CAR. Mitch is taken aback. His car has never talked or balked before! Instead, the car makes an abrupt U-turn and heads for--you guessed it--Mitchell's bed, the parking place Dad has been planning for all along. 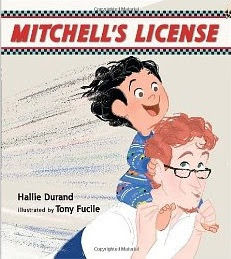 In Hallie Durand's new Mitchell's License (Candlewick Press, 2011), most of the fun for kids and for parents comes from award-winning (for Let's Do Nothing! and the 2011 Caldecott book Bink and Gollie (ALA Notable Children's Books. Younger Readers (Awards)) Tony Fucille's characters' expressions. Mitchell the driver looks more and more like a NASCAR pro on his final winning lap, and Dad, well, Dad's face changes from dogged good nature to downright grim as his son's "driving" becomes more and more wild. But Hallie Durand's clever story line leads them down the last lap and into the parking garage (Mitchell's bedroom) with aplomb and at last with a PLOP! as Mitchell's "car" turns out to be a James Bond Special with a powerful ejection device which brings Madman Mitch right down where he's supposed to be at bedtime. As Publishers Weekly puts it, "this one is destined for family favoritehood."